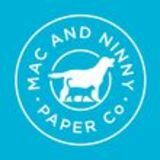 Mac and Ninny 2016 Our letterpress products are designed and printed by us (the good old fashioned way) using our vintage Heidelberg windmill press, manufactured in 1962. It gives them a wonderfully unique look and we love the way they feel too â&#x20AC;&#x201C; lightly embossed into softly textured card. Each piece is printed one colour at a timeâ&#x20AC;Ś with love, care and attention to detail, using hand-mixed inks on carefully sourced and selected card. Bespoke Cards Mac and Ninny have designed a new way of sending personal greetings. Our Bespoke Cards allow you to create your own message with a range of letters, numbers and symbols. Simply slot them into the holding card to send a very personal greeting â&#x20AC;&#x201C; a date, a special birthday or a message of love. Starter Pack Our Letterpress Bespoke Cards are displayed in a specially designed counter display unit, containing six of each letter, number and symbol â&#x20AC;&#x201C; simply order additional Alphabet Cards when required. Each Alphabet Card Starter Pack contains: 18 One, Two, Three and Four Slot Cards, six of each Alphabet Cards â&#x20AC;&#x201C; A-Z, zero to nine plus the heart, amphersand and star, and one counter display unit. Letterpress Cards Our Letterpress Cards are designed and printed by us using hand-mixed inks, applied one colour at a time to give them a unique look. They’re printed on card with a soft, tactile texture, which makes them great to look at and lovely to hold. Coaster Cards Our Coaster Cards include four different biscuits; ‘It’s a boy’ and ‘It’s a girl’ Cute as a Button cards for new arrivals; a good luck four-leaf clover; a gold star to offer your congratulations and a birthday present to mark that special day. We’ve also added a new range of Brilliant Beard cards for the furry- faced gentleman, Many Thanks cards (to say just that) and a variety of other new designs too. Our Watch the Birdie letterpress cards are designed for bird lovers, twitchers and tweeters. Our It’s all about you! range of cards are printed using vibrantly zingy fluorescent inks. Our Ice Creams range of cards are letterpress printed in multiple colours. The deep impression of letterpress adds an extra dimension to these cards. …on subtly textured, soft white card, using our vintage Heidelberg ‘windmill’ press. Christmas Cards We have designed a range of Letterpress Christmas Cards to compliment our Everyday Christmas Cards. Printed by us on our windmill press, they have a deeply impressed texture, highlighting each design perfectly. Our Everyday Christmas Cards are available individually or in packs of eight – two cards of each design in the range – and contained in a specially designed pack. Everyday Cards All our cards are designed and illustrated by us and printed in the United Kingdom using vegetable based inks on Carbon Balanced board made with Elemental Chlorine Free pulp with FSC certification. In addition, the cello bags we use to hold our cards are biodegradable and the envelopes are 100% recycled. We’ve divided our everyday cards into two styles – square and portrait. Our square cards come with a white paper envelope and our portrait cards come with a brown paper envelope. Some of our square cards also come in a portrait version – check the symbols against the codes to find out which. All our portrait and square cards are printed using vegetable based inks on Carbon Balanced Board made with Elemental Chlorine Free pulp containing recycled fibre with FSC (Forest Stewardship Council) certification. Everyday Cards Portrait Cards Card size: 176mm x 128mm Inside: Blank for your own message Envelope: 100% Recycled Brown Envelope size: 184mm x 133mm The portrait cards marked with this symbol have silver embelishments. The square cards marked with this symbol are also available as portrait cards. Planners and Keepers Mac and Ninny have designed a range of Planners and Keepers for gardeners, cooks and travellers. The range includes a Garden Planner and Seed Keeper to help gardeners plan their next flower bed or keep the seeds to sew an award winning vegetable patch. No more rummaging around in drawers for that favourite pizza menu with our Menu Keeper close at hand or deciding what to cook on what day, with our Meal Planner itâ&#x20AC;&#x2122;s all made easy. Thereâ&#x20AC;&#x2122;s also a Travel Planner for your next trip around the globe and a Memory Keeper to store those keepsakes and cards safe and sound. Planners Size: 220mm x 170mm Inside: 192 pages Page Size: 210mm x 148mm Wire bound to conveniently lay flat, each Planner contains 192 pages with paper pockets to store your plans and ideas. Keepers Size: 240mm x 220mm Inside: 12 Paper Pockets Wire bound to conveniently lay flat, each Keeper contains 12 paper pockets to store your garden seeds, takeaway menus or memories. Alphabet Letterpress Bookplates Whether your name is Adam or Zoe, why not personalise your favourite book with one our new Alphabet Bookplates. Letterpress printed onto a heavy, off-white, self-adhesive paper, they have a beautifully tactile feel and will look wonderful in any book â&#x20AC;&#x201C; or why not use them to personalise the front of a notebook or journal. Our NEW range of Alphabet Letterpress Bookplates are printed by us on our windmill press, using hand-mixed inks and the finest quality self adhesive paper. Starter Pack Packed as a single bookplate in a clear protective bag with a backing board, our alphabet bookplates can be bought in trade packs of six, or in a counter display unit containing six of each letter â&#x20AC;&#x201C; simply order additional letters as required. 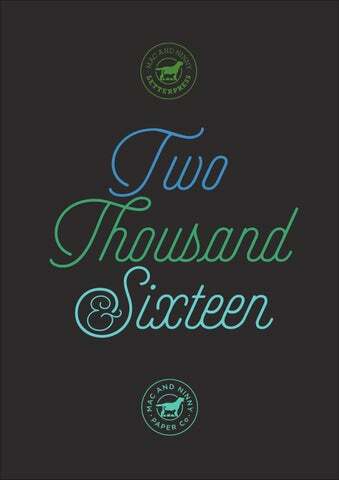 Each Bookplate Starter Pack contains: Six Alphabet Bookplates of each letter A-Z, plus one counter display unit. Each bookplate pack contains one dozen (12) self adhesive bookplates and becomes a library card to help you keep track of your books.